Giacomo and Pavia on the Amalfi Coast. Photo by Ben Schott. Popupla founder Pavia shares what she's learned about how to travel with elderly parents, about the challenges that ensue, about the special considerations to take into account. When I was 32, I spent six weeks traveling around Italy with my parents. My mother was 66; my father was 75. I had spent every summer until college in Italy with my family, so it wasn't odd to be there with them. This time, however, I had planned the whole journey with my travel agenda — innovative restaurants, funky design hotels, get-to-know-you lunches with industry s, visits to picturesque villages on remote hilltops. This wasn't how they usually traveled, but they went along with everything, totally game. One afternoon while I was driving down the Adriatic coast, they fell asleep in the car. I looked in the rear view mirror at my dozing mother and was struck by a thought: "They're my baby birds now, and I have to take care of them." My parents were healthy, and at the time I had no indication that age would ever catch up with them. Yet the thought planted itself so vividly I remember it a decade later as if it happened yesterday. A few years later, age and frailty did catch up with them. My mother was diagnosed with fronto-temporal dementia, and it ripped a hole through my family's heart. My father was bereft, and in an effort to give him some relief, I suggested a trip to Italy, the place that always makes us happy. We flew to Naples with a simple plan: three days at Don Alfonso, an elegant hotel and restaurant on the Amalfi Coast; three days on the water nearby at Lo Scoglio, a family-run seafood restaurant and inn; and three days in Naples, a city I really wanted to explore. When we arrived at Lo Scoglio, my father took one look of the clear blue sea spread out before us and turned to me with a slightly pleading look in his eyes. He hadn't said a word, but I understood. "Okay, Giacomo," I told him. "I'll cancel Naples. We'll stay here." He sat back in his chair, poured himself more wine, and smiled. This trip was about making him happy. Naples could wait. Since that Amalfi Coast trip in 2007, I have traveled with Giacomo a few dozen times. We usually go to Italy, but we've also been to Las Vegas (for the insane New Year's Eve opening celebration of the Cosmopolitan Hotel) and to London (I married an Englishman, and Giacomo is very fond of my in-laws). My husband is usually with us, as are the motley gang of friends from around the world who join us for what has become an annual trip to Lo Scoglio for the July 4th holiday. Yes, I travel with my senior citizen of a father, and so do my pals. Inevitably, it adds to the adventure to have Giacomo along. For one thing, he's always the most dynamic person at the table. In Las Vegas, he taught my journalist friends the fine art of blackjack. (His assessment of the black tie Jay-Z concert we attended on New Year's Eve: "I can't understand a word the guy's saying, but musically he's pretty great.") At the St. Regis in Rome, he had the bartenders hanging on his every word late into the night. These are but two very typical examples of the effect the guy has on people. 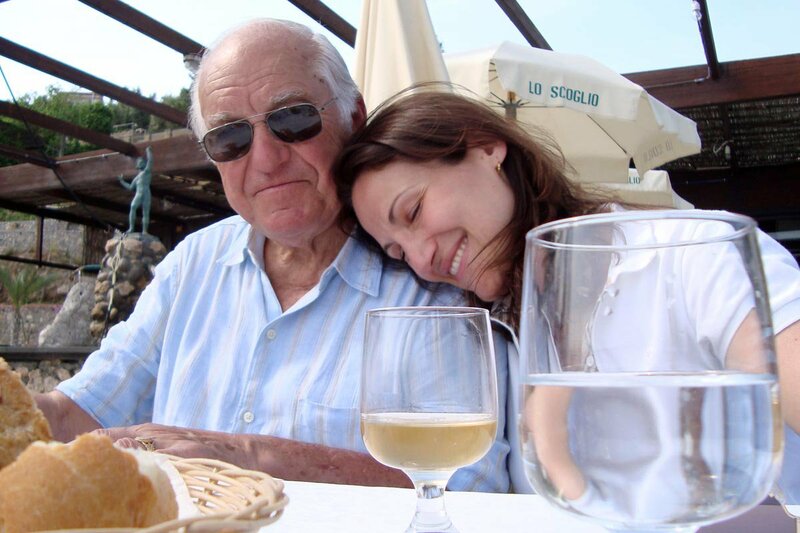 After my mother died, traveling with my father became a picturesque way to solidify our bond and to celebrate the things we Rosatis hold dear, namely spending as much time as possible at a table surrounded by friends, family, and really great food and wine. You know Giacomo likes you when he tells you, "You gotta come with us to the Amalfi Coast next year..."
Over the years, I've learned a few things from my travels with Giacomo, primarily about mobility, flexibility, and accessibility. Last October, I took Giacomo to Spoleto, the town in Italy he most considers home. We had dinner almost every night at Il Trivio, the local trattoria my partner Jeralyn and I frequented nearly every night when we spent a month running Popupla from Italy. It's a quick five-minute walk from our apartment through cobblestone streets to the restaurant, but, for Giacomo and his cane, the slight downhill descent may as well have been Everest. So I rented a car and dropped him off at the door to the restaurant every night. This involved getting the car, finding parking in restricted zones, and ensuring I was sober enough to navigate the tiny streets back home. I like to travel as effortlessly as possible, so I won't pretend that these extra steps weren't hassles. But my inconveniences were overwhelmingly outweighed by his conveniences. In a similar vein, staircases can become unexpected land mines when elevators aren't available or aren't working. A quick flight for me from a subway platform is an impossible stretch when your knees aren't what they used to be. I can no longer get on a subway platform without trying to find the elevator, just in case, not that I'll get Giacomo back onto a New York City subway anytime soon. 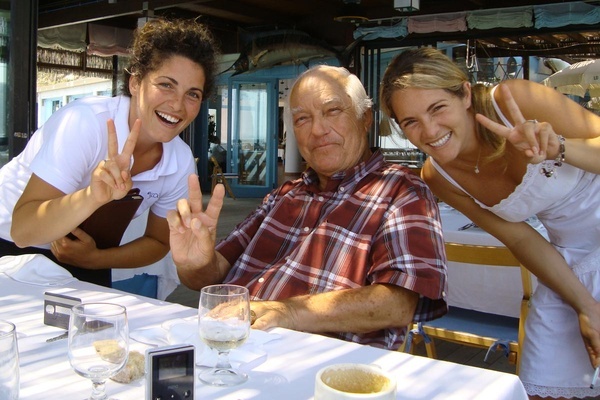 Giacomo with Margherita and Antonia De Simone at Lo Scoglio. On that same trip to Spoleto, our dear friend had planned a glorious afternoon at a nearby vineyard — luncheon feast, vineyard tour, wine tastings. When he woke up, Giacomo wasn't feeling up to it. His legs ached and his stomach was upset. "Go without me," he insisted. "I'll be fine." This was generous of him, and I considered it for a second because I really wanted to see the vineyard, but no. We didn't go and instead spent the day in the apartment. I made spaghetti and we watched a zillion stupid videos on YouTube and we played the Iron Cross, his (probably invented) version of poker and I listened to his stories in the garden under the stars until the wee small hours. What takes me no time takes him longer. When we had to get from Spoleto to the Amalfi Coast, I decided it would be much easier to do it by train (2.5 hours, with a transfer in Rome) than by car (5.5 hours). Travel logic, right? Yes, but the logic was incomplete. It takes me five minutes to get from track 1 to track 18 at the Naples train station. It took Giacomo 25 minutes. He walked slowly with his cane; I walked alongside him, watching him carefully, dragging two rolly bags, two carry-ons, and one laptop bag. I had made a wrong and short-sighted decision. Time wasn't the factor to consider; his comfort was. A few years earlier, we had done an even more complicated journey through Italy by train. He was tired at the end of that trip (I just love Italian trains with no air conditioning in July), but no more than the rest of us. However that was when he was 82, before a pacemarker and other surgeries. At 86, it was another story. I suspect that parents with small children have the same time considerations. Only there's a slightly different emotional tenor. With little kids, you slow down because their capacities haven't developed yet. With older parents, you slow down because their capacities have diminished. With kids, this situation is hopeful and exciting because they're going to grow and get stronger. With parents, it's, well, it's the bittersweet opposite. Let's talk about the bright side. When Giacomo buys his airline tickets or, increasingly, when I buy them for him, we request a wheelchair to help him get through the airport. When I'm traveling with him, I follow along. Wheelchairs are the way to go! I have never breezed through security checkpoints faster, not even when flying first class. Or maybe they can't. My father is a lion. This year in June, a month shy of his 87th birthday, he bought a restaurant. And let's not forget that many people stop traveling well before their ninth decade, and he's still going and shows no signs of stopping. But earlier this year, Giacomo had hip surgery. A long winter of rehab involved learning how to walk again, with falls a serious risk. So when it came time to plan our annual trip to Lo Scoglio, I considered the tile floors, the hard wood furniture, the two flights of elevator-less stairs to his room, and I realized he couldn't do it. My husband and I debated how we were going to tell him and decided we'd wing it when we were next at dinner together. Only before I could even introduce the idea, he announced, "I'm coming, and you're not going to stop me." That's understandable. A lion doesn't want to admit defeat. So I didn't insist. I suggested we talk to his trusted doctors to get their thoughts and left it at that. A few weeks later, he called me. "So you really think I shouldn't go, huh?" "Well, maybe you just sit this one out," I said. "Wait until you are farther along in your recovery." "Maybe you're right," he said. And I could tell he was glad that he could blame this on me and not on him. "But can we go to Italy in October?" Yes, Giacomo, yes. We sure can.